Love her (me!) or hate her, Gwynnie has got to be your BFF when the new year rolls around and you kick it into high clean-eating gear. Gal's got some seriously great recipes (evidence) that are also healthy and simple. What's not to love? This salmon is too delicious. It's got a perfect balance of flavors and couldn't be easier to throw together. Paired with the best brussels sprouts ever, this is pretty much all I want to eat from now on. Whisk together the lime zest, juice, sriracha, maple syrup, and a pinch of salt. Line a baking sheet with parchment paper or foil, place salmon on top, and pour the mixture over it. Roast salmon for 12-15 minutes. Serve sprinkled with cilantro. Enjoy! Yess I loved this salmon when I made it! SO good and easy. I'm a GP lover & proud of it. Oh and don't worry about entering me in the contest - I have the cookbook; but what a great giveaway!!! You are my food soul sister! I follow you on Facebook, twitter, and pinterest! :) This cookbook looks fab! 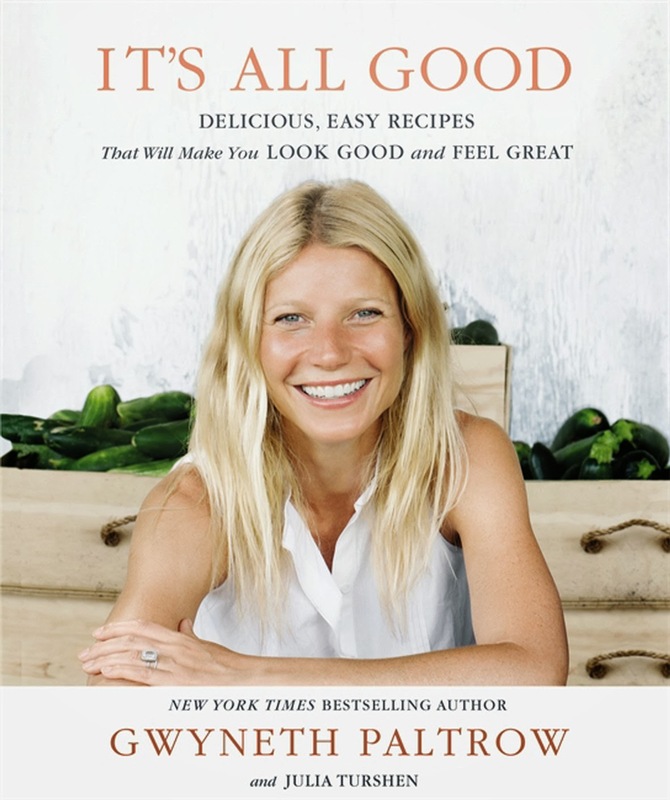 If I make all the recipes in this book will my skin look like Gwyneth's? She is always so glowy. I had to come here immediately when I saw the words Sriracha + Salmon. This looks amazing. Gahhh. I am so hungry!! Glowy is the PERFECT term, haha! Of course I like you on Facebook!!! And I have followed you on Twitter for quite some time. But I was not following you on Pinterest! Now I am. Problem solved. I have always loved flipping through the pages of GP's cookbooks, but never bought one. I think it's time I own one. I would love to receive a copy from your giveaway, especially when I am tempted by blogged recipes. Hello, 2014! It's time to spend more time in the kitchen! Let's try new things! P.S. I follow you on Facebook, Pinterest and Twitter! And I loved salmon. I kind of have a budding relationship with the seafood counter at my grocery store. Ive seen this cookbook featured on a few blogs but glad to hear you gave it such rave reviews, definitely going to look into it. I love spice with lime, so this looks awesome. She has some lovely recipes so I'm not surprised this is another winner. It looks so great - isn't it nice to have flavorful meals that are also healthy! i would LOVE this cookbook! and that salmon looks delicious! i just followed you on pinterest. yay! Yum! You had me at sriracha but I am also always looking for new ways to cook salmon! Follow you on Facebook and Pinterest. Love following your recipes...they always make me hungry! Looks like a great cookbook! I follow you on facebook! This sounds really good!! I never thought to even read this book. Thanks for the recipe and recommendation, the brussels look amazing too! Fun giveaway! i've always been curious about her cookbooks. I liked on FB and I'm following on Twitter! I have her first cookbook and would LOVE to own the second. January is always a hard month for coming up with creative meal ideas, and your blog has been a great inspiration! Hope you're doing well, Marie! Hi Marie! I'm new here to your blog and just wanted to say I love it! I'm new to the food blog world myself and always enjoy finding new blogs and new ways of cooking and baking, anways, just wanted to say Hi!